This nugget will show you the different and easiest ways to perform a Google search and present 10 tips that will take you beyond basic queries. We want you to be able to take advantage of the vast wealth of information that is available on the web. 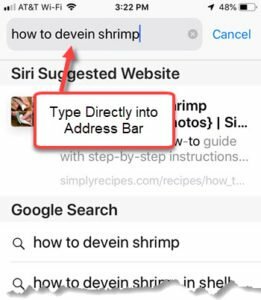 In our examples, imagine that you have just purchased fresh shrimp at your local grocery store and you need to remind yourself how to devein the shrimp before cooking. Using the address bar is the most direct way to perform a Google search. It’s both easy and efficient. There are a couple of advantages of going to the Google site. First you can be entertained by the Google banner as it changes with holidays and events during the year. Secondly, it may offer some options like searching directly for images if you are looking for pictures. On your iPhone and iPad, you can install a Google app that will also present the single search bar, a weather snapshot and allows you to scroll down the screen for trending news stories. 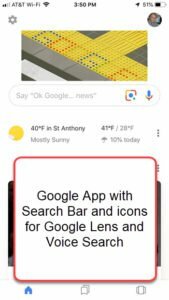 The app also makes it easier to do a voice search or to use Google lens (search using your camera) to conduct a search. Tap the icons in the search bar to explore these capabilities. 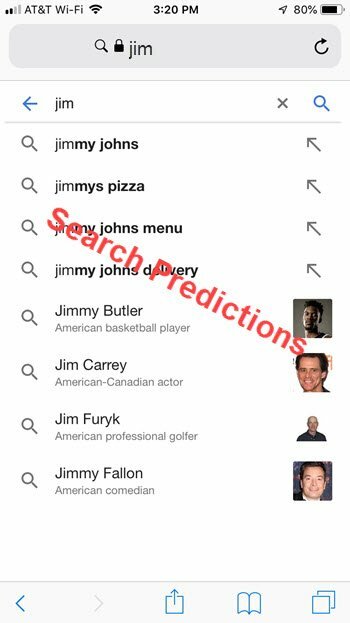 As you type, the Google search engine will try to predict or autocomplete what you are searching for based on your previous searches and its history of searches by others. Use these suggestions to give better search team and faster searches. Tap Go on the keyboard to submit the search phrase and Google will present the search results in the browser. From this, the essential skills is scrolling down the list of resources and pages presented and tapping on the result that you would like to see. Search filters like Images, News, Shopping are available at the top of the search results. Tap on the filter to filter the search to include only those categories. It is a handy and convenient way to tune the results to your needs. The first position in a search result is often a paid ad. 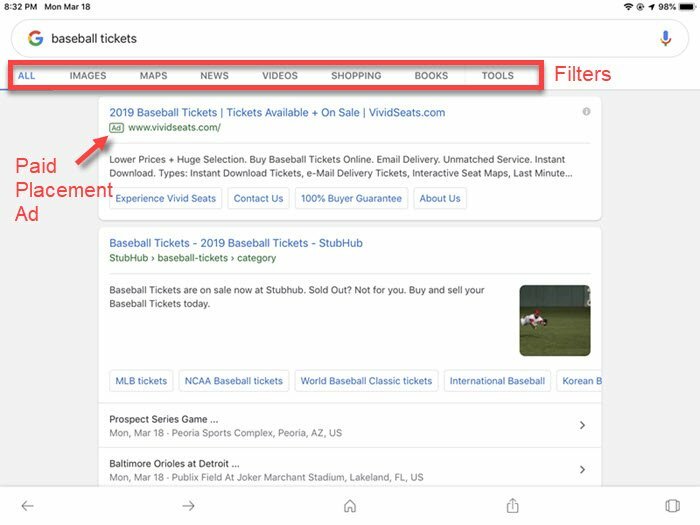 In the screen above, the search was looking for baseball tickets and the first position was “sold” by Google as an ad. Remember Google is a $$mega-billion company. Paid placement will have an Ad indicator as above. Paid placements are the price we pay to use Google searches. Please remember that the paid placement is not always the search item you are seeking. The resource with the paid placement is always looking to sell you something. If you search phrase contains multiple words separated by a space, Google will search for pages where the two words are on the same page. If you wish to search for the exact phrase, surround the two words with quotes (“). When you do a Google search, don’t worry about whether your search terms are spelled correctly. Just do the best that you can and google will offer “corrected” search. For example, if you can remenber the right combinations of e’s and a’s in a work misspelled like permanemtnly? Submit it to Google misspelled. Google will correct. If you are picking someone up at the airport, you only need a flight number and Google will give you the status. This is much easier that going to a specific airline site. You can use Google search to find out where your packages are. You can enter any UPS, USPS, or Fedex tracking number directly into the Google search bar, and Google will find and display tracking information about your package. This is much easier than going to the specific sites for your carrier. 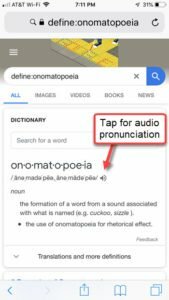 The word is defined and something you can’t get from a paper dictionary is audio punctuation! Google will perform any math that you type into the search bar. Handy if you want to calculate a 20% tip on $29.37. Remember that your can press the Microphone key next to the keyboard space bar in order to dictate a search term into the Google search bar. 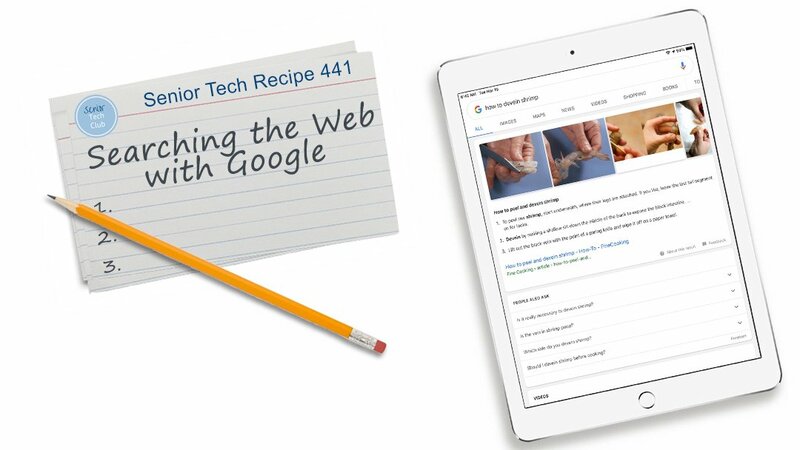 There are hundreds of other tricks and tips for searching the web using Google. However, these eight are both useful and easy for Senior Tech Club members. Give them a try. Identify two ways to submit a Google search. Can you describe how Google makes money on Google searches? How do you search for an exact match of a phrase?